Results: Expanded Or Condensed? Which Format Increased Visitor Engagement? 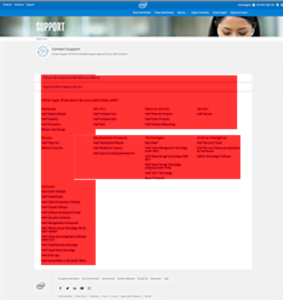 Intel, the intelligent technology company, conducted this captivating chat test in-house, on their site. 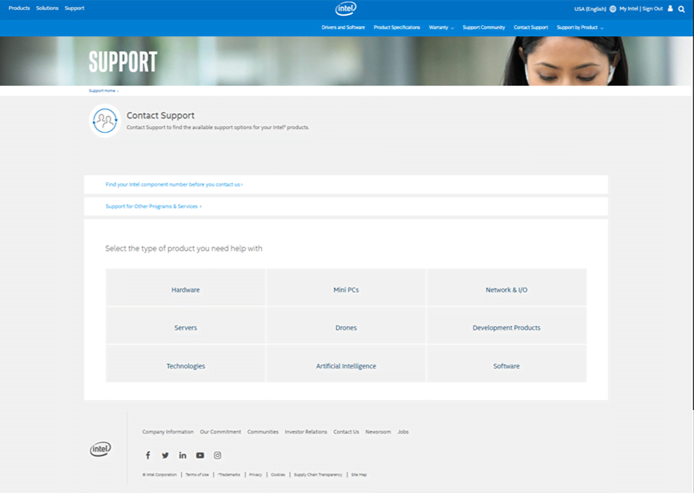 Extensive data analysis revealed Intel’s customer support page was a major pain point that needed to be addressed and optimized. Customer feedback indicated specific product information was hard to find and access. 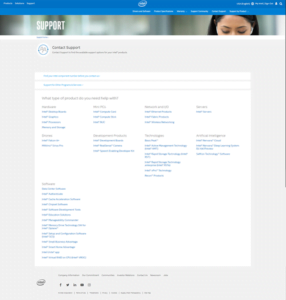 To increase increase customer satisfaction and reduce customer effort, Intel’s testing team dug deep into the data. The testing team suspected simplifying the page would cause to more visitors using the chat widget, resulting in higher engagement with chat function, more time spent on page, and a higher scroll rate. 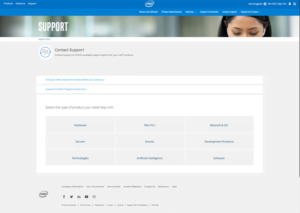 With more customers easily finding specific product support categories and obtaining direct customer support on their specific product category, customer satisfaction would increase. However, the team also considered that simplifying the page structure could backfire. Compressing the view of available product categories could result in fewer people being able to find specific links. So, decided to put their hypothesis to the test. To assess whether a simplified page view would work best, an A/B test was set-up on Adobe Target. The test ran 2 months. Traffic was split 50/50. Engagement with the Chat click widget, time spend on page, scroll rate, and clicks on product categories were measured across both versions. Winner: Version B — the simplified, condensed view was the HUGE winner. Consolidating the information into key product categories lifted engagement with the chat widget an astounding 765.85%! Additionally, time spent on page increased 5%, supporting the idea visitors were more engaged and taking the time to scan through the page content, rather than abandon the site. As well, the scroll rate decreased: a positive sign indicating visitors didn’t need to scroll as much to take in the information. Interestingly, clicks on the page remained relatively even (3.08%, control vs. 3.43%, variant), showing users were nearly equally as likely to click the category link of interest whether it was presented immediately in the expanded view, or deeper in the consolidated view. The result indicated people didn’t need to search through several category links to find the specific category they were searching for. This test is all about TMI. Too much information! From it, we learn the importance of pinpointing and targeting select details. There’s great value in offering only the key pieces that are most relevant to users. Conversions increase when we reduce decision-fatigue and overwhelm by removing unnecessary words that need to be read, reducing decisions that need to be made, and decreasing the number links that need to be clicked. When you present just the top-level, most important information, you give users a great starting point to dive off from. They can next easily hone in on the category that’s most relevant, or of interest to them. 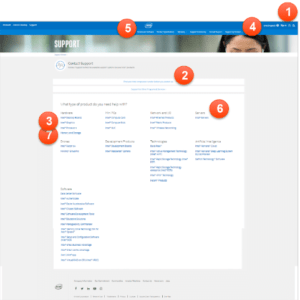 With less information, users don’t need to waste time and effort deciphering all the options. This test also shows the value of presenting information in a way that jives with reading patterns and the way our eyes work. Research shows, we tend to scan information in an “F-shaped” pattern. In Intel’s case, the original version was laid out in an “F” like shape. 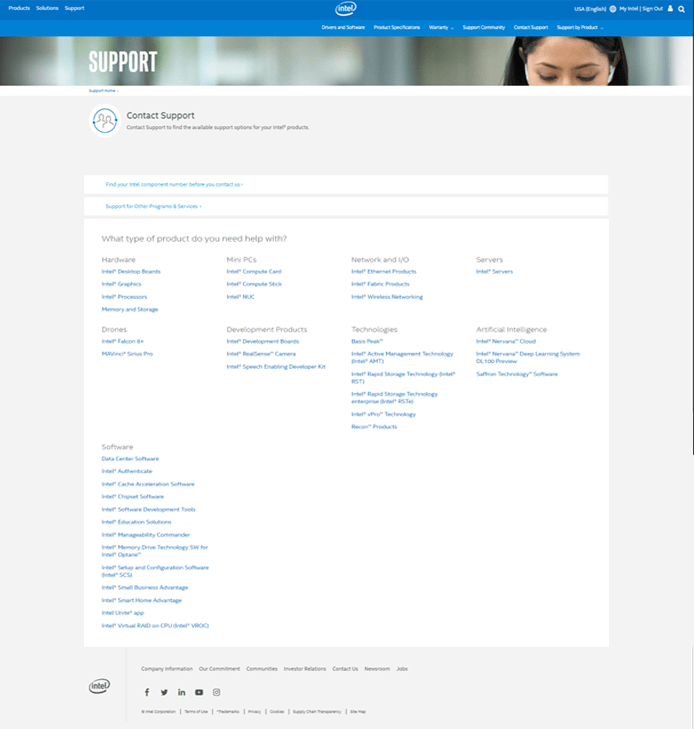 While this formatting could have been seen as beneficial, it actually meant a customer only interested in one product category may have needed to look through the entire list before finding that one product. In the condensed version, scanning was made much simpler. Customers only had to look at a total of nine words/categories to pick the area that was most relevant to them. The task was way less overwhelming. Way simpler. And, way easier. And, therefore, converted way better. Goes to show the value of making things short and sweet. In fear of not providing enough information, many sites go overboard in spelling out every single detail. It can be easier to keep adding information and go in-depth than to consolidate and pull out only the key details. But, offering too much information can work against you. It may mean users won’t be able to easily find the key pieces they’re looking for. Where possible, synthesize the content on your page, presenting easily scannable items with only the most relevant key points and details. 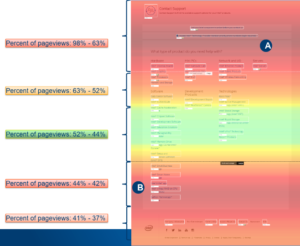 Use data, like pageview analytics and heatmapping views to determine what’s considered key to your users. Looking for more great content like this. You need to become a Pro Member. What's involved?